Henry T’s Jeff Hornberger picked four out of five games correctly in Week 15 and holds sole possession of first place for the season, with a 50-25 record. 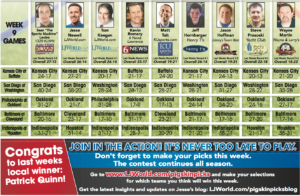 Hornberger has a one-game lead on LJWorld.com sports editor Tom Keegan, who went 2-3 with his selections last week. 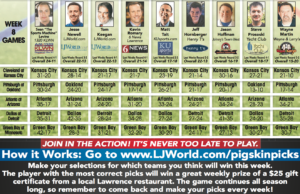 This week, all of the pigskin pickers feel confident Kansas City can beat Indianapolis at home, though some score predictions are closer than others. 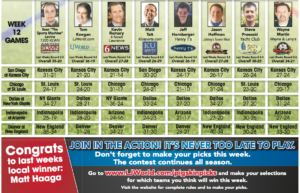 Remember, you are invited to pick the games along with us at [ljworld.com/pigskinpicks]. Congrats to this past week’s local winner, Derek Elliott, who finished 12-4 on the week to nab a $25 gift certificate to Wayne & Larry’s. 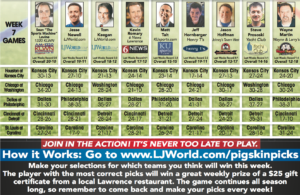 Here’s a look at this week’s picks.